Last night was Date Night! And what a night it was! 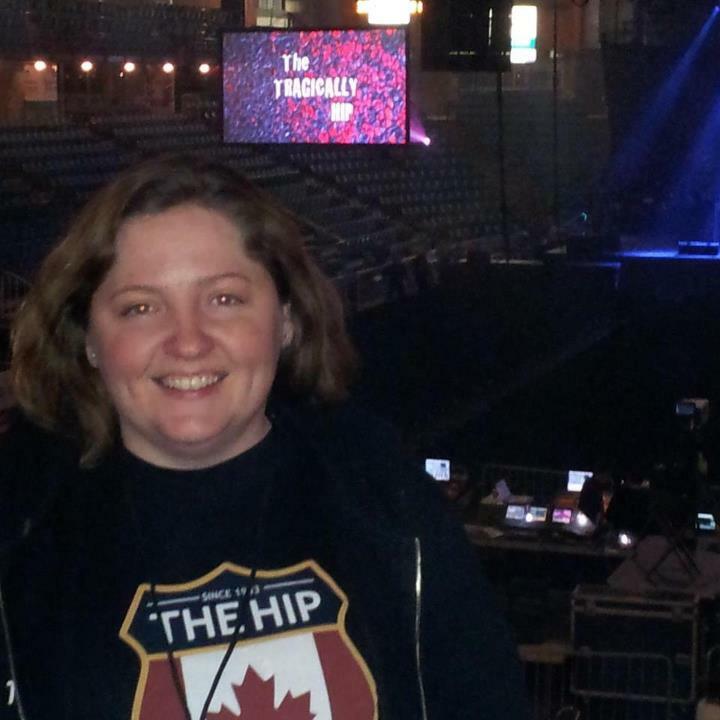 We had tickets to The Tragically Hip in Kamloops, B.C. We started the evening at The Keg which is right next to the arena and had a delicious meal, just the two of us. This almost never happens to I enjoyed it as the rare treat that it was. My wonderful Aunty had charge of our son, so I knew he was in good hands. We had the good tickets which allowed us in the arena a half hour before the general public to buy T-shirts and drinks and find our seats. We were on the floor, third row! I had a great view of the action the whole time. The opening act was a band called The Arkells, who were unknown to many of the fans my age and older, (I thought I recognized a few bars here and there) however, I noticed a few of the younger kids knew who they were and were rocking out. This, and the fact that I had just come from the Keg and held one of the best tickets in the arena made me feel momentarily middle aged, but I soon got over it when The Hip came on. Those kids had no idea where they were! At least they were getting an education and there is something to be said for that. Gord Downie is a performer that's for sure, every fiber of his being is in performance mode. He has a way of acting out the lyrics in a sort of mime so that even the new songs from the album were understood and were completely the band we all know and love. They started the show at full volume and you almost wondered how they would keep up the pace. It was like night and day; the energy in the arena just surged when they came on. They doled out the older hits sparingly, just tastes at a time, while leaning heavily on the new material. It was a nice balance that didn't end up feeling like a reunion tour. My favourite song from the New album Now for Plan A has to be Good Night Attawapiskat. It brings awareness to the issues and it's just a damned good Hip tune. Even the teens could dig it. The encore started with Little Bones (yay!) and they calmed us all down with Fiddlers Green, which was amazingly beautiful. All in all it was a perfect evening and I was sad when my coach turned into a pumpkin. Oh well, back to real life, I guess, but an experience I won't soon forget! I am so jealous!!! that would have been so much fun!! Happy Ninth Day of the Year!